Tim Burton’s Charlie and The Chocolate Factory is the next immersive installment in Edible Cinema’s series of sensory adventures and their ﬁrst ever outing with the museum’s giant Imax cinema, which seats over 400 and boasts a screen the height of four double decker buses. For those who aren’t in the know, Edible Cinema is a creative initiative organised by renowned unusual party organizer, Polly Betton who has partnered with experimental chefs Blanch & Shock for this very special screening. 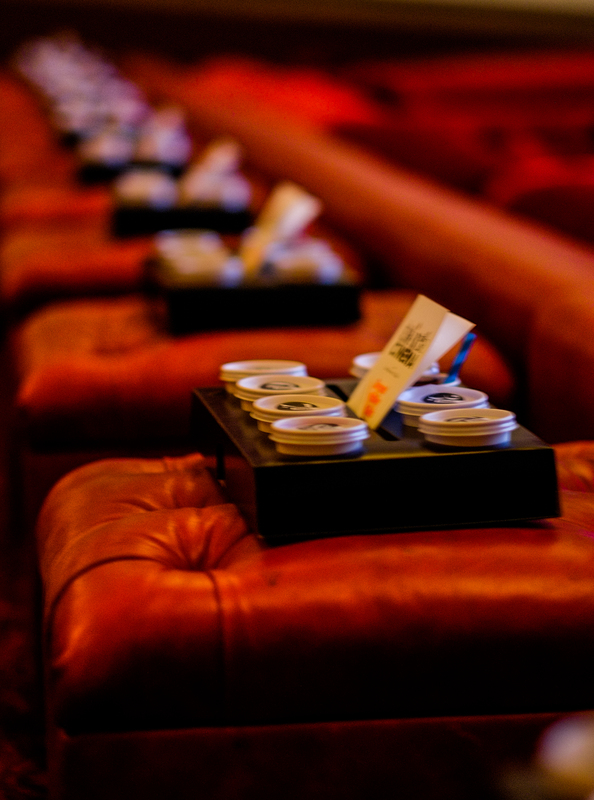 Turning a night at the cinema into a memorable event, Edible Cinema has been described by Vogue as ‘gastronomic theatre’, and ‘the ultimate marriage of ﬁlm and food’ by Time Out. 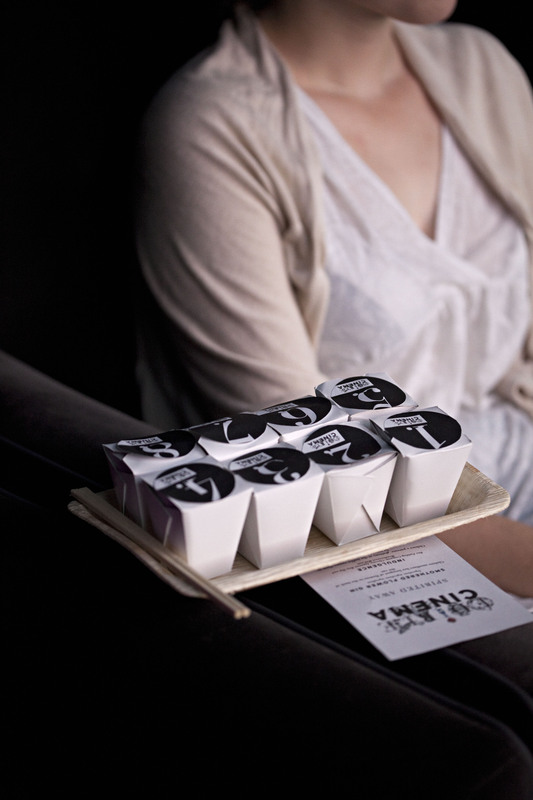 The experience promises to harness the power of taste, smell and texture to enhance the cinematic experience. 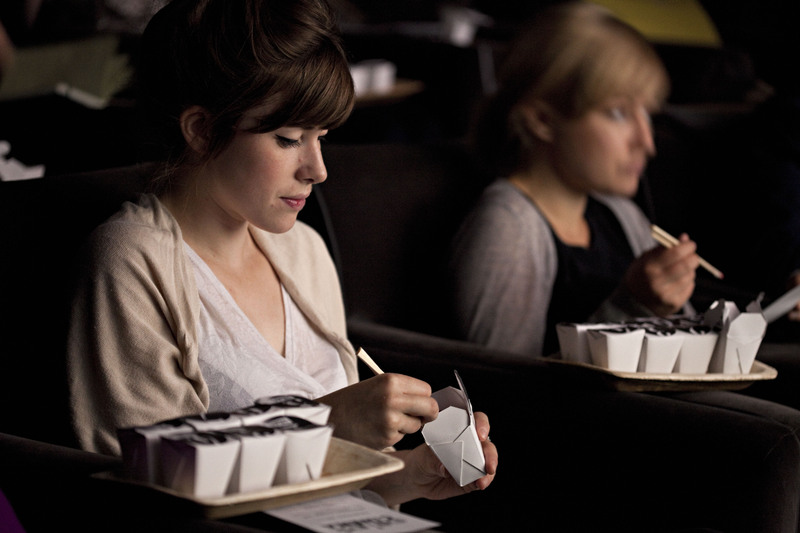 Each guest is supplied with a tray of numbered ‘mystery boxes’, containing a bite-sized tasting menu corresponding to scenes in the ﬁlm. At speciﬁc moments in the ﬁlm, a signal indicates what should be opened when. Previous titles include Pan’s Labyrinth and An American Werewolf in London (curated by Jonathan Ross and Jane Goldman), to name but a few. The ﬁlms selected are visual feasts that lend themselves to a multi-sensory experience. Reluctant to reveal too many inventive twists, Betton says ‘expect a sweet/savoury menu delivering some visceral thrills alongside the action on screen, including gum that tastes like a three course dinner and Augustus ﬂavoured chocolate covered Goop.’. Edible Cinema menus focus less on literal interpretations of food shown on screen, and more on environment, dialogue and the overall feeling. In the opening scene in Pan’s Labyrinth, the characters walk through a pine forest that was enhanced by the burnt woody aromas of pine-smoked popcorn, the ‘crunch’ mirroring the sound of feet on a pine needle ﬂoor, transporting the audience to the scene. In a screening An America Werewolf in London, the ﬁlm features a scene where David sets his sights on the tramps that would soon become his evening meal. At this moment, guests were ushered to dine on a ‘tramps ﬁnger’, of smoked quail, complete with charcoal nail, which evoked shrieks from the audience who delightedly recoiled in the gruesome horror that the protagonist would soon unleash. And back to the forthcoming adventure of a young Charlie Bucket inside a chocolate factory, a perennial classic that was written by Roald Dahl for children. Polly Betton does forewarn that this will be an adult-only outing, so it would be advisable to leave the kids at home on this occasion. Posted in art and tagged after nyne, after nyne film, after nyne magazine, cinema, edible cinema, film, food. Bookmark the permalink.